Changes of the summer evapotranspiration regime under increased levels of atmospheric greenhouse gases are discussed for three Alpine river basins on the basis of a new set of simulations carried out with a high-resolution hydrological model. The climate change signal was inferred from the output of two simulations with a state-of-the-art global climate model (GCM), a reference run valid for 1961–1990 and a time-slice simulation valid for 2071–2100 under forcing from the A2 IPCC emission scenario. In this particular GCM experiment and with respect to the Alpine region summer temperature was found to increase by 3 to 4 ∘C, whereas precipitation was found to decrease by 10 to 20%. Global radiation and water vapor pressure deficit were found to increase by about 5% and 2 hPa, respectively. On this background, an overall increase of potential evapotranspiration of about 20% relative to the baseline was predicted by the hydrological model, with important variations between but also within individual basins. The results of the hydrological simulations also revealed a reduction in the evapotranspiration efficiency that depends on altitude. Accordingly, actual evapotranspiration was found to increase at high altitudes and to the south of the Alps, but to decrease in low elevation areas of the northern forelands and in the inner-Alpine domain. Such a differentiation does not appear in the GCM scenario, which predicts an overall increase in evapotranspiration over the Alps. 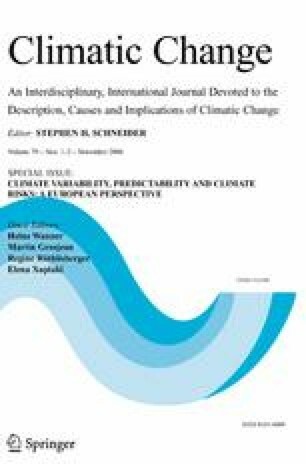 This underlines the importance of detailed simulations for the quantitative assessment of the regional impact of climate change on the hydrological cycle.